Amazon has partnered with merchants in areas like food delivery, movie ticketing, bus ticketing and travel, where one sees customers transact at higher frequency. 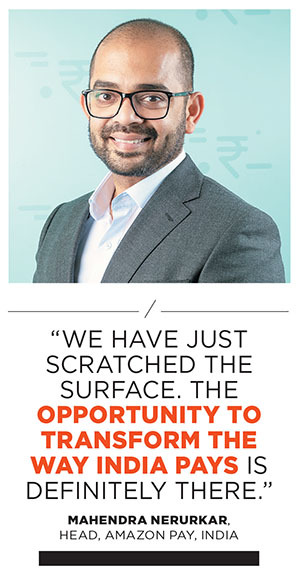 “That’s kind of our play, where we’re looking at the core customer problem and working backwards from it to build an experience that is trusted and convenient and can help us replace cash,” Mahendra Nerurkar, head of Amazon Pay in India, said in a recent interview to Forbes India. For now, the partnerships are typically about customers being able to use their Amazon Pay balance amounts to, say, book movie tickets via BookMyShow, buy a pizza at Domino’s or pay bills at ACT Fibernet. The latter two are among the most recent merchants tying up to accept Amazon Pay and the number of such merchants has gone over a thousand, Nerurkar says. In future, expect Amazon Pay to become a much broader platform for a combination of retail and personal finance. For instance, if a customer used a loan from Capital Float to buy something on Amazon, it could be loaded straight on to her Amazon Pay balance. “You are in the right direction in thinking that,” said a person familiar with Amazon’s partnership with Capital Float. Extend that to Acko or BankBazaar or other investments Amazon has made, and it’s easy to see that the sum of all such partnerships will be a platform that offers the three things that every Amazon executive is expected to obsess about—choice, convenience and superior experience. Nerurkar says: “If one were to look at specialised startups, they are helping us figure out how to build the right consumer solutions to extend credit to the right kind of customers.” And there is a lot of innovation happening on each of the three fronts—simplifying payments, extending credit and getting consumers to become habituated to online commerce, he added. The partnerships also help both Amazon and the startups to slice and dice their customer segments, and tailor products. 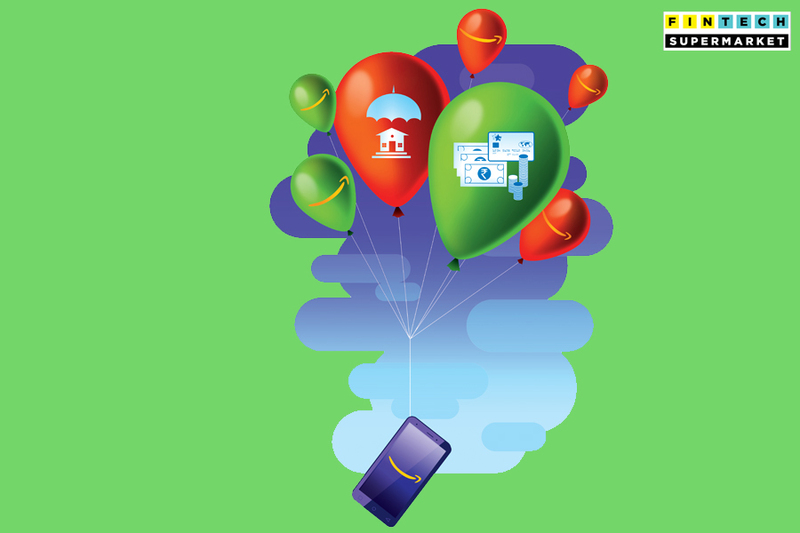 For instance, visit the website of Mumbai-based digital insurer Acko to see a promotion that offers special, lower, prices only to Amazon customers. The segmentation can be sharper. “There are products we are looking at only for Prime customers, but I think it’s early days,” Varun Dua, Acko’s founder and CEO, said in a recent interview to Forbes India. He’s referring to subscribers of Amazon Prime, which offers free and faster shipping, and access to video and music streaming and other benefits for an annual subscription. “Whatever understanding we have of our customers, and whatever intelligence the startups have in terms of figuring out the right risk profiles for the customers, we’ll be able to extend credit to these customers through the right channels… it’s early days, and we’ll see how it develops,” says Amazon’s Nerurkar. That logic extends to Acko and other such partners too. The Indian market is shaping up differently from China, where typically, there is one or at best two dominant players in a given internet business. In India, there are at least three ecosystems shaping up, led by Amazon, Walmart (which purchased India’s Flipkart), and Alibaba Group Holding (which has invested in Paytm). All of them will want to do everything on their ecommerce platforms, Hinduja points out. Indian conglomerates such as Reliance Industries, which publishes Forbes India, will be looking to build their own ecosystems as well. With partnerships such as the one with Capital Float, “it’s pivoting to the zone where it can cater to the merchants’ side of the business also”, says Arnav Gupta, an analyst at Forrester Research. While Amazon isn’t aggressively competing with Google Tez or WhatsApp payments, for instance, what it is trying to do is to get its own customers on to the Amazon Pay platform, and make, through various promotions, Amazon Pay a habit each time the customers look to make a payment online. At the other end, it is bringing more and more merchants into the ecosystem. 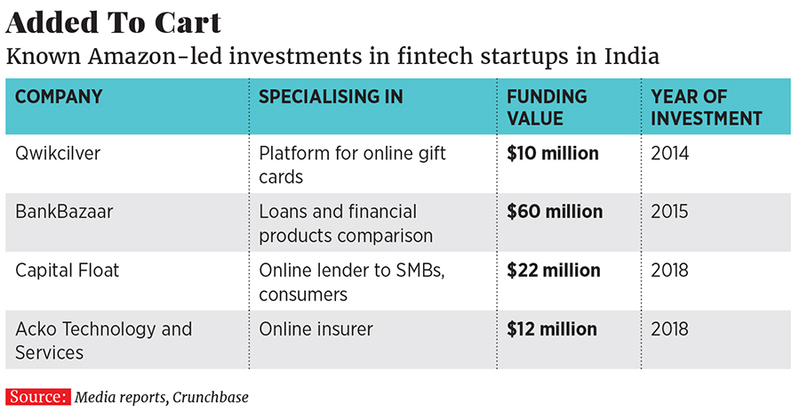 By incentivising both consumers and merchants to use its fintech ecosystem, Amazon also gets access to a lot of data. If one looks at it, it always has a long-term strategy that can look ahead to the next 15 years or 20 years, Gupta points out. Therefore, “while it has been slow off the blocks with Amazon Pay, I’m pretty sure that as it starts building it, it will build an entire ecosystem around it, and it will have a much more comprehensive set of services to offer,” he says. The effort helps merchants too, which is the other big part of the equation, not only making it easier and cheaper for them to get paid—for instance, by eliminating the cost of cash-on-delivery—but making credit much more attractive and easily accessible to them to help them grow their businesses. This continual innovation is also reflected in the way cash-on-delivery has transformed and several digital features have been added aimed at coaxing the cash-paying customer to go cashless. For instance, a customer can pay cash at his doorstep, but also immediately convert that into what Amazon calls ‘stored value’ on Amazon Pay. Say, she ordered something worth ₹475 and has a ₹500 currency note to pay for it. The stored-value account can be created at her doorstep by the Amazon delivery agent by putting the remaining ₹25 in the Amazon Pay balance to be used for the next purchase. Besides, if a customer isn’t home at the time of delivery, the agent can send an online link to the buyer, using which the payment can be completed with Amazon Pay or another online vehicle, like the UPI (the Indian government’s Unified Payments Interface).